Engine Intake Manifold Gasket Set Fel-Pro fits 2001 Ford Mustang 4.6L-V8. Feature 1 : Meets or exceeds all original equipment specifications. Feature 2 : Application specific design to ensure a perfect fit. Feature 3 : Engineered and manufactured specifically for repair applications. Marketing Description - 2000 : Fel-Pro(R) gaskets offer 100% vehicle sealing with application-specific materials to give you sealing solutions with the performance and durability professionals trust. Application Summary - 2000 : 2001 FO V8 4605cc 4.6L. Country of Origin (Primary) : US. Feature 4 : Unsurpassed quality you can trust. Feature 5 : Validated for fit, form, and function. Feature 6 : Includes all parts needed to complete the repair. Harmonized Tariff Code (HTS) : 8484900000. Interchange Part Number : 238621, FELMS921214, 231036, IG4153A, MS4747. Life Cycle Status Code : 2. Life Cycle Status Description : Available to Order. Other Part Number : MS19238, 572004. Product Description - Invoice - 40 : INTAKE MANIFOLD GASKET. 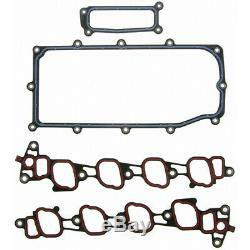 Product Description - Long - 80 : INTAKE MANIFOLD GASKET SET. Product Description - Short - 20 : INT. See Item Specifics section for additional specifications about this part. To confirm that this part fits your vehicle, enter your vehicle's Year, Make, Model, Trim and Engine in the Compatibility Table. Also review the notes section in the compatibility chart for additional specifications about this part. This part generally fits Ford vehicles and includes models such as Mustang with the trims of GT Bullitt Coupe 2-Door, GT Convertible 2-Door, GT Coupe 2-Door. The engine types may include 4.6L 281Cu. V8 GAS SOHC Naturally Aspirated. This part fits vehicles made in the following years 2001. This item may interchange to the following part numbers from other brands. Brands: AUTOPART INTERNATIONAL, AUTOZONE INC, AUTOZONE/MAHLE ORIGINAL, DNJ ENGINE COMPONENTS, ISEAL PERFORMANCE (CORTECO), MAHLE ORIGINAL, PARTS MASTER/ROL, PRONTO/ROL GASKET, ROL, VIC-TO-DROP-USE-MHL Part Numbers: 231036, 238621, 572004, FELMS921214, IG4153A, MS19238, MS4747. The company was established in 2007. Head-quartered in Chicago, USA, the company is dedicated to providing high quality consumer products directly to our customers. We are an authorized dealer for more than a 100 brands. Our Goals Hebron Stores was founded by enthusiasts, for enthusiasts, and we are committed to delivering value to our customers. At Hebron Stores we have one primary goal, and it is to make sure that every customer is 100% satisfied. Every employee at Hebron Stores is dedicated to accomplishing this goal. Our engineers constantly research and develop the best performing and highest quality products. Our corporate office and customer advocacy teams constantly work to bring high quality products at affordable prices, directly to you. 10% of all corporate profits go towards charity. The charities we support are handpicked and we ensure that they are ones that make a difference in the community. For God so loved the world HE gave HIS one and only Son, that whoever believes in HIM shall not perish but have eternal life. For God did not send HIS son into this world to condemn the world, but to save the world through HIM. Portions of the part information on this page have been provided by WHI Solutions, Inc. The item "Engine Intake Manifold Gasket Set Fel-Pro fits 2001 Ford Mustang 4.6L-V8" is in sale since Monday, May 7, 2018. This item is in the category "eBay Motors\Parts & Accessories\Car & Truck Parts\Gaskets\Intake Gaskets". The seller is "hebronautoparts" and is located in Bronx, New York. This item can be shipped to United States, Canada, United Kingdom, Denmark, Romania, Slovakia, Bulgaria, Czech republic, Finland, Hungary, Latvia, Lithuania, Malta, Estonia, Australia, Greece, Portugal, Cyprus, Slovenia, Japan, China, Sweden, South Korea, Indonesia, Taiwan, South africa, Thailand, Belgium, France, Hong Kong, Ireland, Netherlands, Poland, Spain, Italy, Germany, Austria, Bahamas, Israel, Mexico, New Zealand, Philippines, Singapore, Switzerland, Norway, Saudi arabia, Ukraine, United arab emirates, Qatar, Kuwait, Bahrain, Croatia, Malaysia, Brazil, Chile, Colombia, Costa rica, Dominican republic, Panama, Trinidad and tobago, Guatemala, El salvador, Honduras, Jamaica, Antigua and barbuda, Aruba, Belize, Dominica, Grenada, Saint lucia, Barbados, Brunei darussalam, Ecuador, Egypt, Guadeloupe, Iceland, Jordan, Cayman islands, Martinique, Nicaragua, Oman, Peru, Paraguay, Reunion, Viet nam, Uruguay.